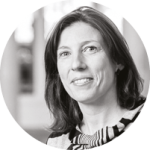 Associate Professor in Media and Communication and Convenor of the Journalism Research Group, School of Media and Communication, University of Leeds. In the eight days before Election Day newspapers made blatant and deliberate attempts to influence readers’ votes and, to a lesser extent, shape parties’ campaigning strategies. Measurements of salience, tenacity and circulation demonstrate that the weight of opinion within the British press was hugely in favour of the Conservatives. 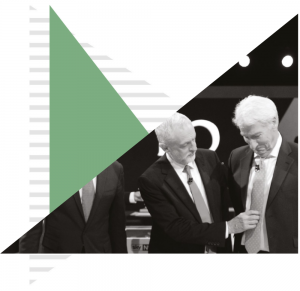 However, the surprise election outcome leads us to look beyond these relatively basic measurements to consider how a more nuanced analysis of editorials can provide a more complete picture. With only the Mirror and the Guardian endorsing Labour, and the Observer recommending tactical voting (Table 1), Conservative partisanship was the most salient voice in the British national press (Figure 1). Five Conservative newspapers intervened in 88% of opportunities, totalling 35 editorials, and tabloids published an editorial every day. The Mirror and the Guardian utilised 87% of opportunities, totalling only 13 editorials and, more importantly, few that explicitly called for a vote for Labour, and even fewer that categorically endorsed Corbyn. 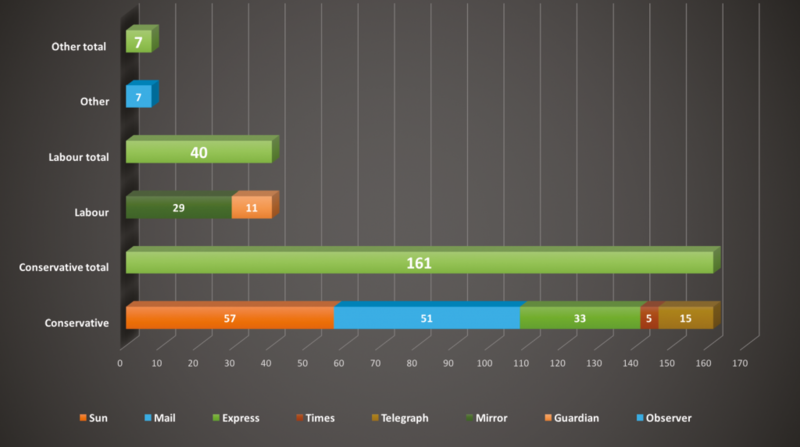 Taking account of the creative and persuasive techniques of opinion leading, newspapers’ tenacity scores (Figure 2) illustrate that the vigour of opinion in favour of the Conservatives was four times (161) that for Labour (40). As one would expect, tabloids not only ‘pimped up’ their editorials to maximum tenacity but projected their views through a diversity of content (see Figure 3). The individualised ‘presidential’ focus on leaders put newspapers in the proverbial position of being stuck between a rock and a hard place. Both took predictable partisan lines but, significantly for the result, neither side mustered much enthusiasm for the leader of the party they endorsed. Left-wing critiques predictably discredited May’s ‘strong and stable’ claim, with the Observer calling for a vote against May’s ‘feeble plan for Britain’ and the Guardian decrying her Brexit policy. More importantly although right-wing papers, particularly the tabloids, gave Corbyn a rough time, their continuing absence of direct support for May is of equal note. Here, the Express was alone in its unreserved support, backing her with an appeal to nationalist Brexit sentiments. By contrast, the Sunday Times opposed May as “not Tory enough” and their opinion accurately summarises the lukewarm support of right-wing broadsheets – “There are plenty of good reasons for not voting for Mr Corbyn and Labour, but Mrs May has not provided many good reasons for voting Conservative”. 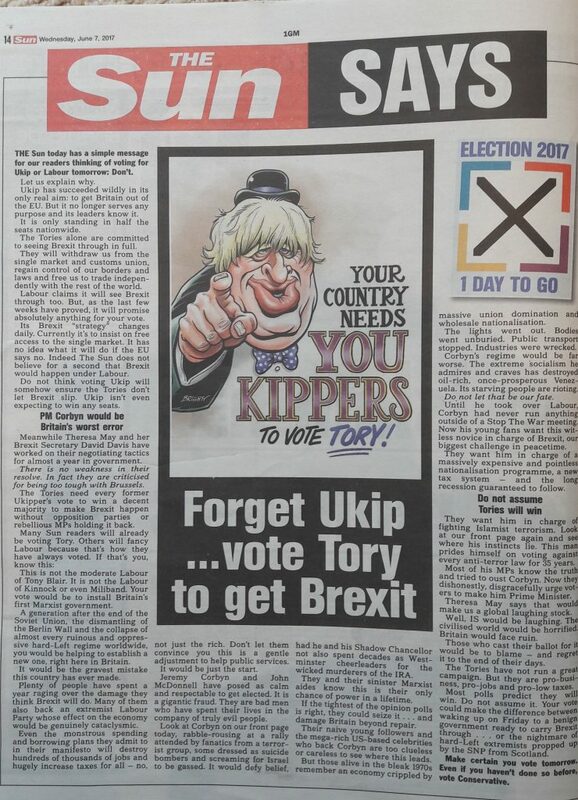 Support for May in the Sun and the Daily Mail was conspicuous in its absence due to an all-consuming focus on discrediting Corbyn. 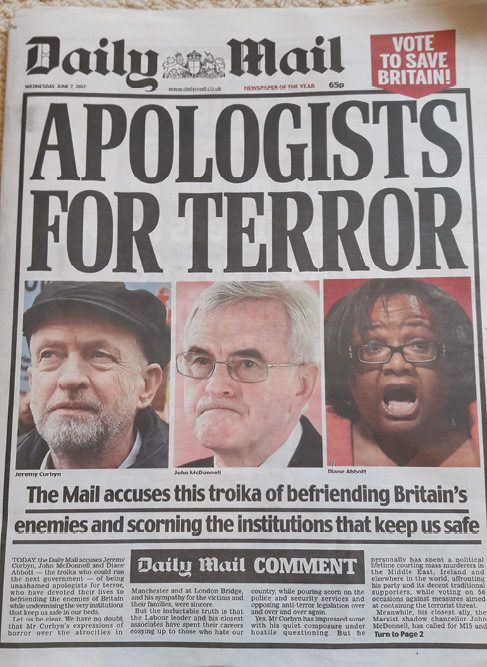 The tenacious opinions of right-wing papers clustered around the dominant claim that as a dangerous “extreme left-wing Marxist” with past affiliations to terrorism, Corbyn must be kept out of government due to his unfitness to govern and his policies amounting to fantasy. The severely hostile Express and Sun invoked notions of violence describing Corbyn and his cabinet as a gang, a mob, and thugs. The Daily Mail’s anti-Labour discourse was less individualised encompassing critiques of the shadow cabinet. In addition to repeating the claim that a vote for May would “save Britain from the terrorists’ friend” the Daily Mail focussed on Corbyn as “economically illiterate” claiming that he “would wreck Britain” and that a hung parliament may lead to a “coalition of chaos”. The less fierce Telegraph stated that Corbyn was “promising what he can’t deliver”, and criticised Corbyn as incompetent, wrongheaded, dangerous. The Times was more reserved, focusing on his policies as fantasy, calling him a protestor not a politician. 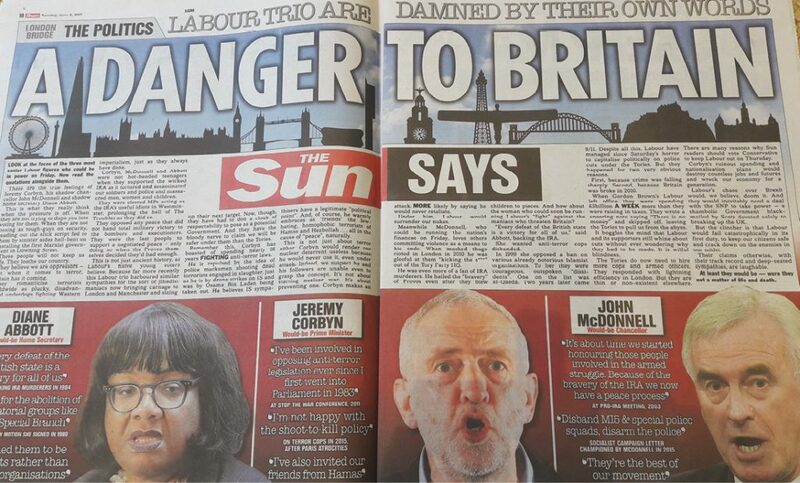 Left-wing papers left these emphatic anti-Corbyn discourses unchallenged and added to the dearth of support for Corbyn with reluctant and muted endorsements. Acknowledging their previously expressed criticisms of Corbyn as “ill equipped” to be PM, the Mirror hesitantly bridged the gap between the undesirability of Corbyn who is “not all we would wish” and their expression of far stronger support for Labour and its policies. The Guardian’s editorials not only lacked tenacity, they ignored Corbyn, who became the ‘elephant in the room’, only mentioned in one editorial five days before the election. In this, the only editorial which claimed that “Labour deserves our vote”, the Guardian devoted much space to criticising Corbyn “who unquestionably has his flaws” urging him and Labour to become more centre-left. Such disapproval combined with claims that ‘to limit the Tories by tactical voting makes sense’ undermined their endorsement. On polling day, the Guardian was so staggeringly pre-occupied with criticising May and worrying about Brexit that it forgot to endorse any party and didn’t mention Corbyn or Labour. Coupled with the Observer’s strong critique of Corbyn, and papers’ comparatively modest critiques of May as feeble, foolish, weak and wobbly, left-wing papers were an unconvincing trio of Labour support. With newspaper readership and Conservative voters skewed towards older generations, readers may well have responded to the ambivalence of newspapers’ endorsements of May. Yet on the same note, Labour’s gains defied the determination of right-wing papers’ denunciation of Corbyn and the highly qualified endorsements of left-wing papers. 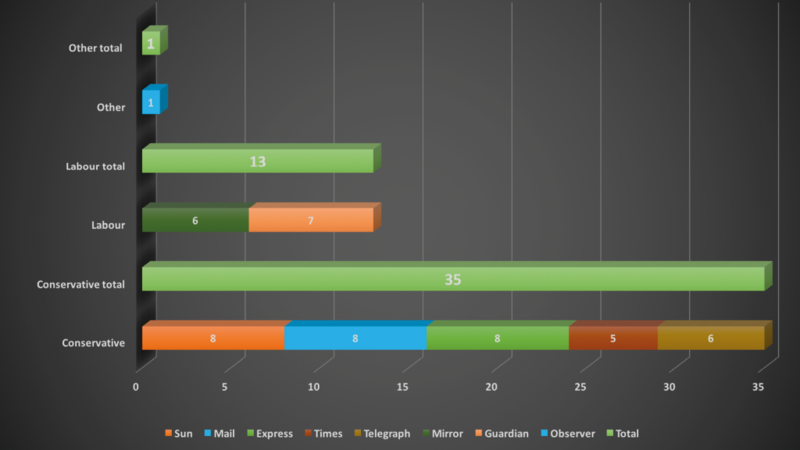 A tentative explanation points to the limited influence of left-wing papers due to low readership in comparison to the right-wing press, and to the impact of the new cleavage in British politics – age. The Labour surge has been attributed to young voters who constitute a dwindling proportion of newspaper readership – the young people who voted Labour were not tuned into newspapers’ anti-Corbyn editorial opinions. If newspapers’ opinion leading roles are to endure they must ask: where were young people and how can newspapers get there? The tenacity score is the aggregate daily score for each paper with points awarded for each of the following: 1 for each editorial comment; 3 when one editorial took up the entire editorial space; 3 for a full page editorial; 3 for editorial appearing on the front page; 1 for a photo or cartoon.